The 3,135 new daily high temperature records in July 2012, over 100 per day, exceeded cold records by a factor of 16.6 to 1. The heat record count was the highest since the phenomenal 6,182 in March. 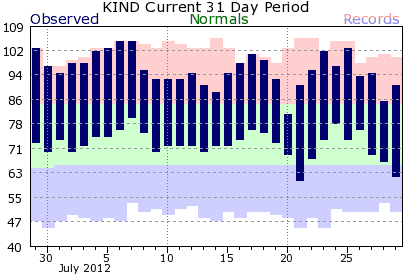 For the summer to date (June-July), the ratio is now 7.9 to 1. For 2012 overall, the ratio of 11.8 to 1 is over 4 times the value for 2011. The heat record count is a little less than half of the 6,788 records set in the record hottest month of July 1936, which is actually quite impressive given the additional 76 years of data since then. Furthermore, this July's ratio is 23% higher than the 13.5 in 1936. 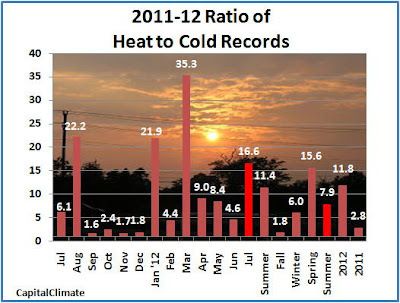 - Monthly ratio of daily high temperature to low temperature records set in the U.S. for July 2011 through July 2012, seasonal ratio for summer and fall 2011, winter, spring and summer 2012 to date, and annual ratio for 2012 and 2011. Aug. 7 Update: Preliminary unadjusted data from NCDC show the July average at 77.3°, which is 0.1° below the record. 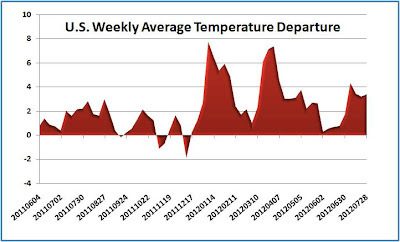 The preliminary weekly temperature analysis, posted this morning by the National Climatic Data Center (NCDC), continues to show July 2012 as the hottest month in U.S. history. The national average temperature for the week ending July 28 increased to 77.6°, which is 3° above the climatological normal. 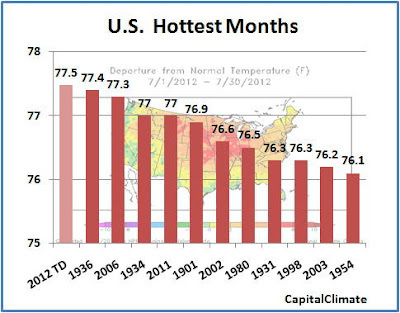 The month-to-date average of 77.5° is 0.1° above the all-time hottest month of July 1936. July 2012 will go down in history as the warmest month of record at Indianapolis. The average temperature for July will remain near 84 degrees...eclipsing the previous record of 82.8 degrees set in July 1936 by nearly one degree. The average monthly temperature was 84.1 degrees through the first 29 days. The temperature will exceed 90 degrees on both Monday and Tuesday at the Indianapolis International Airport. The number of 90-degree days for the month will climb to 28 ... besting the old record of July 1901 by 3 days. At the end of July the total number of 90-degrees for the year will be 43...the most for a year since 1988. The record is 58 days set in 1983. July's record for the most 95-degree days in a month is expected to climb to 19 on Tuesday. The previous record of 16 was set in July 1936. The total number for the year will increase to 22 days ... trailing only 1936 with 31 and 1988 with 23. The number of 100-degrees days for the month will likely remain at 7...second only to July 1936 which had 9 days. The yearly total will also remain at 9 days...trailing only 1936 with 12 and 1934 with 10. The current forecasts do not indicate any 100 degree temperatures for the Indianapolis area. The latest 100-degree reading for the Indianapolis area occurred on September 15, 1939. 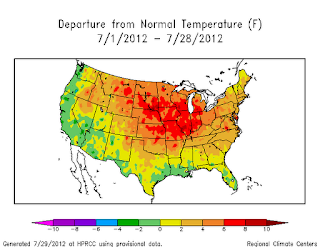 As posted last week, preliminary reports indicate that July 2012 is likely to be the hottest month since U.S. national temperature records began in 1895. With just 3 days left to go, CapitalClimate analysis of National Weather Service reports from 215 stations across the 48 contiguous states shows that the unadjusted U.S. national average temperature was 3.4° above climatological normal for the week ending yesterday, July 28, down slightly from 3.6° last week. This was up, however, from the National Climatic Data Center (NCDC) adjusted result of 3.2° in the previous week.